What Do You Know? It's Day Five of Our Twelve Days of Discounts! 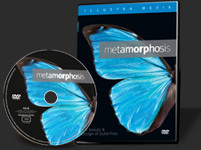 Save 20 Percent on Metamorphosis: A Companion Book to the Film! We Know that Stephen King Endorses "Intelligent Design," but Why? > Dante on the "Angelic Butterfly"
Dante on the "Angelic Butterfly"
When Darwinism Goes Begging: Metamorphosis as "Evolution's Freak Factory"
Movieguide: Metamorphosis is "Fascinating and Eye Opening"
From "An Interview with Lad Allen, Producer and Director of Metamorphosis"
A Free New Companion e-Book to Metamorphosis Explicates the Latest "Icon of Intelligent Design"
We Got Your Intelligent-Design Tattoo Right Here! Butterflies Set to "Mess with Texas" Tonight at Southern Methodist U.
Butterfly Patterns: Convergent Evolution or Design?